Years ago I lived in a 1 bedroom apartment with a HUGE hall closet set up to hold a washer and dryer. 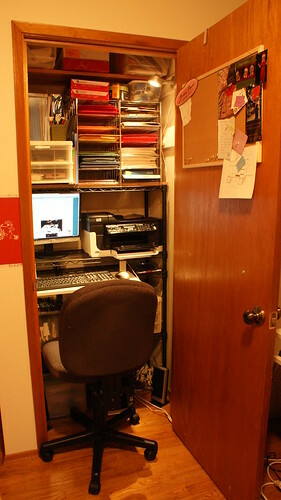 We had a laundry room on site so I never bothered to buy/rent my own machines so I found a desk from Ikea that I was able to assemble IN the closet to create my very first "cloffice" (closet-office). It worked great. When we moved into our house, I was able to create a real office and craft room in our spare room but if you've been following this blog, you know that very room needs to be turned into a nursery over the next few months. I don't mind so much that most of my craft supplies will need to move to the laundry area out in the garage but I don't think the computer would survive the extreme temperatures so I had to find a place to keep it inside. I decided the baby wouldn't need a closet for awhile (we'll have plenty of drawers and hanging space using O's old chifforobe. This weekend, Cloffice II was born. 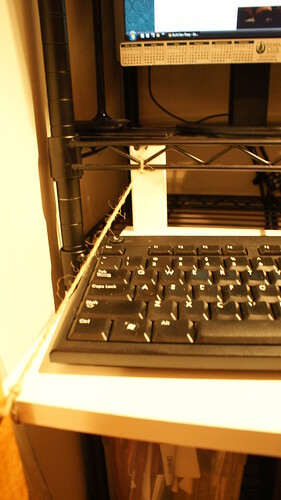 The most important thing to me was that I could keep my couponing materials near the computer so that's all below the homemade keyboard tray. I was also thrilled to find a place to put my bulletin board as well as all the miscellaneous supplies stored up above the workstation. It slides in and out as it should and the posts at the back corners enable the tray to support the weight of my arms even when the tray is pulled all the way out. I know, I'm supposed to keep my wrists off the desk but it doesn't happen. 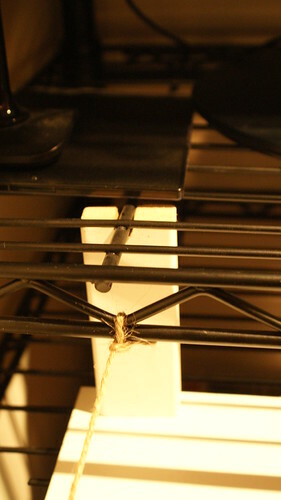 The post is just a piece of scrap wood cut to 4 inches tall with a notch drilled out of the top so it runs along one of the stronger wire beams under the shelf above. The twine stretches between the front edges and the shelf above just to add a little extra support although I don't think it was necessary. It doesn't slide in and out smoothly but it also didn't cost me anything so I'm content with my homemade keyboard tray. Do you have a cloffice? Do you have any suggestions for seating? I'm going to need to move that chair out to my new crafting space eventually. the key board tray is awesome! I do like the fact that you can just close it up when needed. I will have to put up some doors. Looks great! thanks for stopping by! !